Welcome to the Ceramiche Bianconi Pietro srl. We are a family business that has been working in the field of ceramics since 1974. 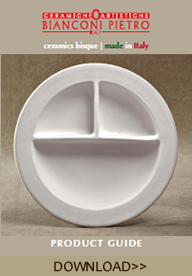 We create and produce semifinished ceramic products called bisque. Since the early years of its life, our company has played an important part in manufacturing in the domestic ceramic market. Today, with a growing business, we export our products all over the world looking mainly to the Hobby market. Our factory is located in Gualdo Tadino, in Umbria (ITALY). Our creative abilities and passion for ceramics are the main ingredients of our work. Our mission is to produce bisque products with innovative design, providing excellent service, exceeding all customer expectations in terms of quality, whilst, at the same time, respecting both human resources and the environment. Our long experience in the production of bisque has been handed down to our children today, thanks to their innovations, we have a company that is even more dynamic and flexible than ever. If you have any questions regarding bisque please contact us and we will be glad to help contribute to the success of your business!